BISH, or British International School of Houston, floated the Lower Colorado River in early December outfitted by Texas River School (TRS). Seventeen students and three instructors took float on a 4-day 3-night adventure to prepare for a final excursion as part of their curriculum titled the Gold International Duke of Edinburgh Award and Expedition. The group consisted of mostly international students and teachers that hailed from such countries as United Kingdom, Pakistan, Germany, France, Scotland, Italy, and the U.S. Guided by TRS trip leader Spider De Victoria, the group put-in on Wednesday, December 2nd under the Montopolis Street Bridge in the warmth of the afternoon sun. Their first night was spent at Texas River School’s River Camp, 5-miles south of Austin, with successive nights spent on sandy bars on the river. While two students had to drop out the first day due to illness, the remaining 15 students had a great trip with many learning experiences. When asked by Joe Kendall if they would do it again, they all responded positively. 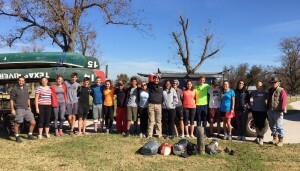 The trip ended on Saturday, December 5th at Big Webberville Park, where all 10 canoes were unloaded and cleaned before boarding the bus back to Houston. All in all, a successful trip for both BISH and TRS; we hope to see them again. 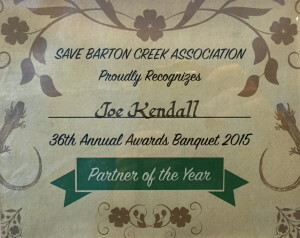 Texas River School and Executive Director Joe Kendall were recognized on Monday, November 23, 2015, as SBCA’s Partner of the Year at the 36th Annual Save Barton Creek Association Awards Banquet. Olivia Hayden, Director of Development & Community Relations for SBCA, presented the award. On-hand to help accept the award was the TRS staff and several members of the Board of Directors. Joe took particular pride in introducing his younger staff who “are a serious, enthusiastic, experienced group of young people ready to take over the program.” Congratulations Joe Kendall and Texas River School.